One of the most beautiful historic sites in Fatimid Cairo is located off Darb al-Asfar, just half way between Bab al-Futuh and al-Hosain mosque. Bayt al-Suhaymi recently reopened after extensive renovation and restoration. Like numerous other antique buildings, Beit al-Suhaymi was drastically affected by the 1992 earthquake and was badly in need of restoration. Covering some 2,000 square metres, the five-floor house (or beit) has a total of 115 halls and chambers surrounding a main court, itself more than 200 square metres. Another open area contains a water-wheel and grinding mill, typical elements of a medieval Cairene house. The interior is lavishly decorated with floors of coloured marble and intricately worked ceilings, doors and cabinets that demonstrate the splendid art of interlocking woodwork. The house of al-Suhaymi, built in 1648 with additions in 1796, is a Cairene house from the Ottoman period with strictly separated public (salamlik) and private spaces (haramlik). In addition to the open spaces, the salamlik included the takhtabush (a large benched area which opens onto the courtyard like an iwan where business transactions were carried out in the morning), the second-story maq'ad or loggia (an informal reception area used usually in the evenings), and the qa'a (the formal reception hall). The haramlik section, which includes a qa'a, or reception hall, as well as private apartments and a bath, is located above the ground floor and is reached by a separate flight of stairs in the courtyard. The different spaces of the haramlik overlook the courtyard through openings concealed by mashrabiyyas, screens created from pieces of turned wood that allowed women of the household to enjoy the view without being seen by the guests in the courtyard. The entrance passage, which turns to provide an indirect barrier between the public and private, leads into a delightful courtyard of shrubs, birds and a central fountain. The courtyard is not only a place of beauty and calm, but serves as light source and as temperature regulator. During the evening, cold air is trapped within its confines; during the day this air is dispersed into adjoining rooms and spaces. The ground floor and open spaces belonged to the men. The large benched area at the far end of the courtyard was the tahtabush, an area where the owner of the house could transact business affairs, or when no outsider was about, the women of the house could gather. Just beyond the courtyard there is another one, larger and completely redone. Here, an old flour mill works once again and an old well has been re-excavated. Stand in the salamlik, the large reception room off the 1st courtyard just to the left of the entrance, and gaze up and around. The cool tiles of the floor, the central water fountain, the high, decorated ceiling, the soft light filtering through the enormous mashrabiya window – all of these ensure maximum coolness in Cairo’s heat. Stand in the domed bath and see the colored glass skylights and look at the channels that allowed water to run into the bath. Climb the stairs to the haramlik, the women’s quarters, and look down upon the courtyard through the mashrabiya windows, admire the Syrian tiles decorating the room and cupboards. The exit leads through the other two newly restored houses. 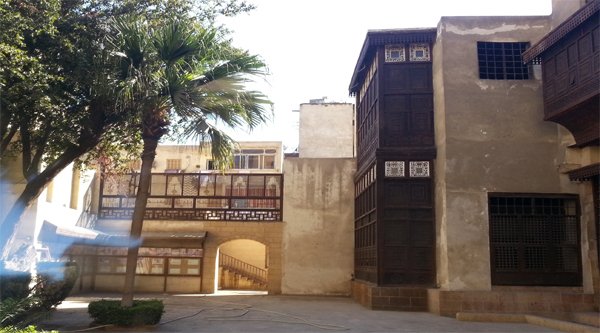 The house of al-Khurazati from the 19th century and the house of Mustafa Ga’far 1713, who was a coffee trader at the Wikala of Dhu al-Fiqar. The qa’a, where neighborhood girls once learned sewing, has now been handsomely restored.